Replaced by the 3274_1 and the 3531 - Optical Rotary Encoder HKT22, sold separately. The 3274E is a 24 volt gear motor, generating 173 Kg-cm of torque at 15 RPM. It's a large motor that provides an amazing amount of torque. 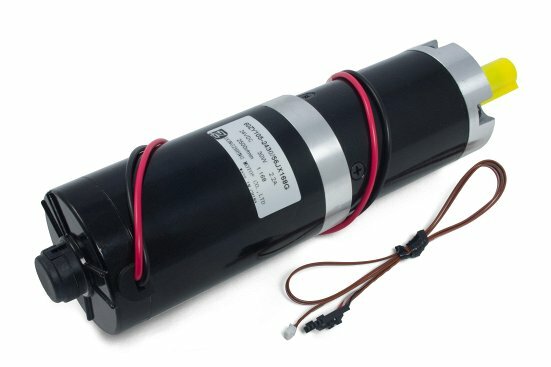 This motor comes equipped with an E4P US Digital Encoder, which keeps track of the motor's rotation, allowing you to control your motor precisely. The 3274E DC motor connects to the 1065 - PhidgetMotorControl 1-Motor. The mounting holes on this motor are compatible with the 3339 - Mounting Bracket (NEMA23).